So much has happened in the last 30 hours. It feels so surreal. What started out as a trip out to the Crowsnest Pass for some winter camping, turned into one of the most terrifying, exhilarating, and joyful days of my life! For those that don’t know, my wife Angela was pregnant, right around 32 weeks. Starting early in our trip, Angela had been having steady contractions so we quickly dropped the kids off with her parents, and sped off into town (Blairmore) to get things checked out at the hospital. Our efforts to get into the hospital in such a hurry were not in vain, our suspicions were confirmed when we were told Angela was in early labor! We knew what the due date was, a whole 7 weeks and 3 days away, but baby was coming! But it was happening, and fast! The next hour was a flurry of activity. Doctors and nurses strategizing delivery options, phone calls to get Angela’s records, and getting set up on the proper equipment to monitor both her and baby. The original plan was to air-lift to Calgary, an idea that scared me bad as I knew that option didn’t really have me in the picture. The choppers aren’t designed for passengers, I would have to drive up to Calgary (a 3 hour drive) and pray I made it there in time to be with Angela for delivery. Too windy. All aircraft was grounded due to the gale-force winds. The second plan was to drive the ambulance “hot” (lights and sirens) to Lethbridge with the doctor on board in case they had to deliver on the road. This idea included me being there, I liked it better than the previous plan. Not enough time, baby was coming and wasn’t waiting for anyone. We would deliver there, in Blairmore. Our pastors, parents, our prayer warriors. It was obvious that baby was coming early; we knew we needed to pray that God would catch this little one up to where he needed to be developmentally for birth. God had to do in a matter of hours, what normally took place over the course of many weeks. But God wasn’t nervous. God’s word says that he knits us together in our mother’s wombs (Psalms 139:13.) His word also says that He knows in advance everything we need, and He makes it available, so when we come to Him in faith, we receive it all (Matt 6:8.) So we went to Him confidently in faith and in prayer believing that God would do the impossible. And it was so. Brody Liam Marois was born on December 25, 2011 at 11:28PM. Our Christmas baby! 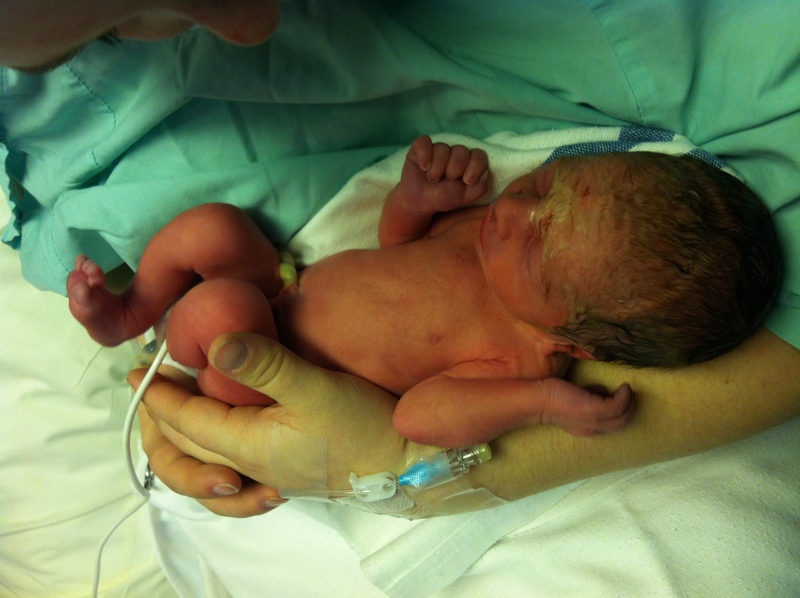 He was born crying, which I’m told is very unusual for premature babies. (Glory to God!) He was kept on oxygen until the transport team from Calgary arrived and was soon breathing on his own. (Hallelujah!) God had blown us away with a brand new baby boy for Christmas! Brody was then carefully and tenderly transported back to Calgary by some of the best medical professionals I have ever seen in my entire life. They worked confidently and swiftly, as a team to ensure Brody was given the best of care and attention. Angela followed Brody in another ambulance and arrived at Foothills Hospital in Calgary early Monday morning. I packed the kids up and then we all headed for Calgary to see Mom and Babe. We have received nothing but great reports from the doctors and nurses regarding Angela and Brody, God has taken care of us and filled us with his peace beyond measure. I cannot explain it; it really is peace that surpasses all understanding. We have received tremendous support from all of our friends and family through-out this fantastically, terrifying ordeal and for that we are so grateful! We have truly seen the Body of Christ in action, we feel so loved. We went from being a family of five, to a family of six in mere minutes it seems. All the while, God has been our Rock, our strength, our peace, our hope, and I will praise Him forever! He has done a great thing in our family in adding to it this wonderful, beautiful baby boy. Glory to God in the highest, and on Earth, peace, goodwill to all men. I remember Angela telling me numerous times that the bike would take me anywhere, I just needed to provide the direction, throttle (or brakes), and to be able to hang on. (This is both exhilarating, and terrifying.) 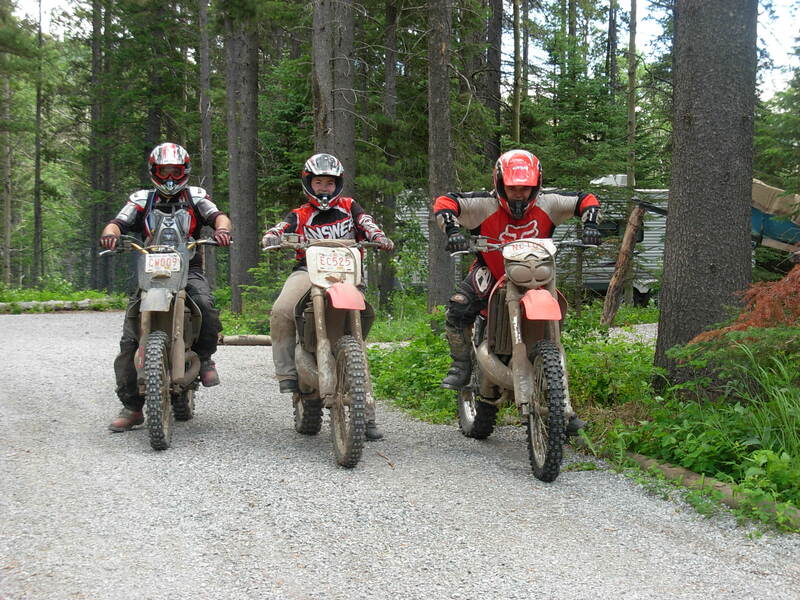 A dirt bike is specifically designed to climb hills, chew through mud, and scream down the straight-a-ways at breakneck speeds. I also learned that you don’t put your feet down when riding; contrary to what feels natural, this is how you keep your balance, and stay in control. It took me a long time to learn this one, as I would put my feet down often when it seemed like I was slipping around. I didn’t have enough confidence in the bike or my own skill to keep them planted on the foot-pegs. I also learned what the bike sounded like when it was in power band (the optimum RPM range.) I had to listen to the engine to know when I should down-shift, up-shift, brake, or crack the throttle. However, as I became more confident, my riding style became a bit more aggressive, and I began to utilize the bike’s controls more. As long as I could hang on, (it’s harder than it sounds at times…) I found these things to be true! It would go anywhere I had the courage to let it take me! I began to test my limits more often, trying things that moved me out of my comfort zone. I soon realized that I could shift my weight, lean the bike, and it would effortlessly follow the path the front tire was taking. The bike knew what it was doing; I just needed to know how to operate it! I know that I can trust the Word of God; I have seen it working in my own life as well as the lives of others. Just like I have seen a more experienced rider take my bike up a hill “I” couldn’t climb, the bike knew what to do. Like the Word of God; it responds to the motions of the operator. The mindset, experience, agility, confidence, and the skill of the rider all play a role in the results. These are the same variables in our daily lives; our expectations, our faith (or lack of), confessions, and actions can have a drastic effect on the outcome of our situations. The Word of God mixed with our faith (Heb 4:2) will get us through anything. What is it that is stopping you from climbing that hill? Whatever it might be, choose today to aggressively apply the Word of God to your situation, mix it with your faith, and hang on! The mountains in front of you will melt like wax, and God will give you the victory. His Word says so! Hold those thoughts for just a moment or two; I want to talk about Joseph. In all honesty, there are only a handful of verses talking about Joseph, the husband of Mary. However, he played a crucial role in not the conception, but the arrival in general. You have probably seen the powerful video “Facebook Christmas” that has been circulating through emails, and Facebook postings. In a brief scene, it shows Joseph hurt and/or confused when he found out Mary was with child, (he knew he wasn’t the father.) Joseph actually planned to break off the engagement quietly, as he was a good man and did not want to disgrace her publically. (Matt 1:19 NLT) An angel came to him in a dream and told him not to be afraid to take Mary as his wife, so he did. I have come to understand just recently, that when God places a gift or dream in us He also puts some coverings in place. Let me explain. First, He puts in place a spiritual covering (Himself,) and he also puts in place a physical covering, another human being to support and encourage us. In this case the gift was Jesus, the recipient was Mary, and the physical covering was Joseph. As Mary’s husband, he was designed to be her constant source of encouragement and support. When people would heckle, it’s my strong conviction that he would put his arm around her, and lead her out of the crowd to a safe place. A place where they could regroup, and remind each other that they were called by God to carry out this important task. This rings true for every gift and dream God has placed in us. We aren’t designed to do “life” alone. You are supposed to be a Joseph to someone, as am I. We need to work together to complete each other instead of competing with each other. Will you pray this week, about whose Joseph you are supposed to be? I know I’m going to. Don’t forget that you can follow my blog via email, you can sign up in the column to the right. P.S. In case you haven’t seen the video, “Facebook Christmas” can be found here. *The meat and potatoes of this blog came after listening to a podcast done by (Edit: Danny Chambers) of Oaisis Church. As humans we are consciously and subconsciously comparing ourselves and our situations to others. This is dangerous business, if it’s continued; someone is going to get hurt. After I realized what I had done, I apologized, repented, and began to realize something. Will you choose with me to stop comparing altogether, especially in your marriage? I guarantee that you will feel more fulfilled when you do.